Welcome to our Bible Crafts section! We’ve got lots of fun activities you can use to enhance your Sunday School or Homeschool Classroom! You can also search our site by Old and New Testament bible stories if you need something specific. Craft time with preschoolers can be lots of fun just be sure you have lots of hands print and easy to assemble, so you can spend less time with the prep work. Our Creation Bible College is a great way to help children to understand the days of Creation. Children use our printable pages to make a collective collage they can hang up or use in their notebooks. 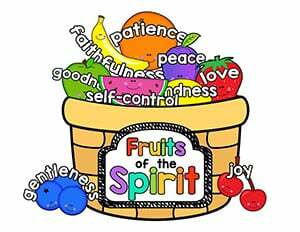 This is a fruit of the spirit craft where different fruits onto a basket. Help them to learn the different values God calls us to posses. A bible craft based off Joshua 24:15. Children color, cut and glue stick a house with the bible verse "As for me and my house we will serve the LORD." Children list their sibilings and ways they can help take care of them. Searching for some fun Christian Themed Puzzles? This page has some wonderful Preschool aged puzzles you can keep on hand to do during quiet time. This is a craft in which children cut out the 5 loaves of bread, and the two fish, then glue them to a basket to make their own miracle basket! Talk with children about sharing, and about what God can do with what we share.......even if it's only a little! A simple coloring page you can use as a springboard for your Christmas Craft Projects. Children can glue on hay or straw, and a felt blanket for Baby Jesus. This is a fun craft for children to make some special Valentine's Day cards for their friends and family. Have children color in the cross with white crayon, then use watercolor to paint rainbow stripes across the hearts. Check our out personal blog for step by step photo instructions. A simple yet stunning Bible craft for children to complete this St. Patrick's Day. Children add rainbow paper or streamers to create a beautiful rainbow coming from the cloud. A scripture card is glued to the back to remind children that their treasure is in Heaven. This is a simple craft for children to water color the different colors of the rainbow. Children can use basic scissors skills to cut and paste the clouds on the rainbow. A great project when learning that true strength comes from God. Children color, cut and past the earth on top of the child's shoulders. When children assemble this printable tower, they can read a simple Bible Verse about giving all honor and glory to God. This is a fun Christian Earth Day Craft and Activity you can do in your classroom around Earth Day! Children color and cut out a pennant, and tape to a wooden ruler (for measuring). Makes a nice take home present too! These make great classroom or homeschool activities for New Years. Younger children cut and paste their goals from the list on the right. Older Children can think up their own and draw their own pictures. The suggested resolutions listed on the right are Christian themed and will inspire children to make a stronger commitment to the Lord. This is a craft in which children can make their own rocking boat in an ocean of waves. Then retell the story as Jesus calms the storm simply by speaking! 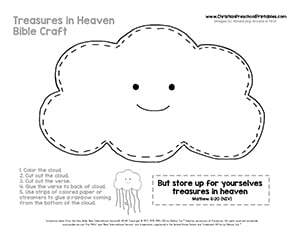 Children can color, cut and paste their own heavenly treasure box! The verse is featured alongside some important heavenly treasures. These make some fun take home cards for children to remember the two greatest commandments that Jesus talked about, "Love the Lord your God" and "Love your neighbor as yourself"
This is a fun little set of 2 bookmarks, One for the Old Testament and One for the New Testament. Each have all the books of the bible on them including some key pictures for remembering some important stories. This craft is really easy, and lets children go home with a great message to share with their family. He is Risen! The perfect craft to do around Easter time. A fun praise the Lord craft to make a shaker for children to use during worship time. This is a printable Craft you can use for learning the different parts of the Trinity. Children cut out the hearts, template. Let them decorate with green paint and green glitter or stickers. For extra fun, let them use crepe paper around the sides and edges of the shamrock. Use these printable stars to make children headbands they can wear during the lesson. There are black and white versions for children to decorate their own. Use construction paper for the band.